Accounting is a well-known profession for those who are analytical and love numbers. It's a career-field that also pays well whether you're able to work for an employer or start your own business. 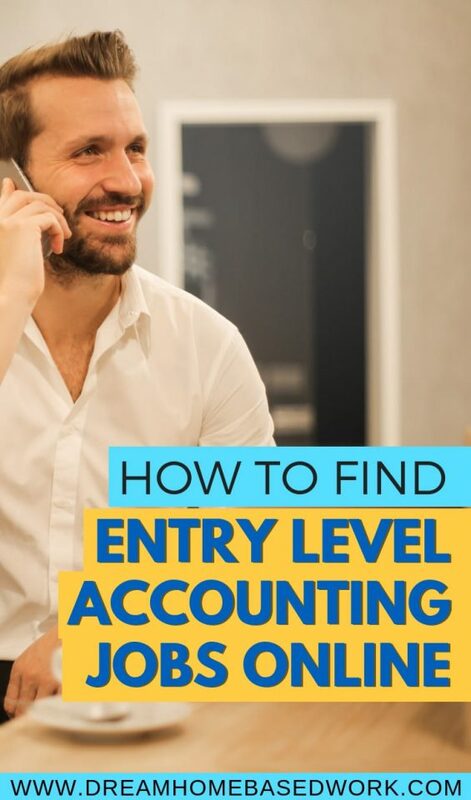 Even entry-level accounting jobs have many options as it's a pretty stable profession that isn’t going to go away anytime soon. This is also a job you can do from home since all you generally need is a computer and access to a spreadsheet or accounting software. Due to the constant need for accounting professionals, there is most likely a need for accountants in your area if not right from the comfort of your home. 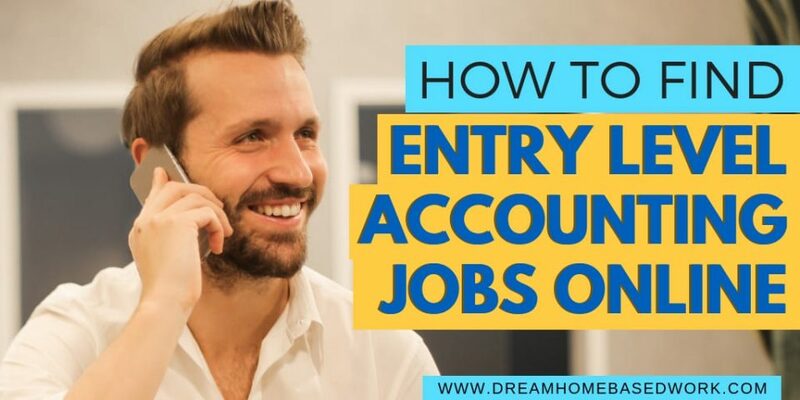 If you're looking to start working from home in the accounting field, in this post I'll explain some key skills you'll need, education requirements, along with how to find an entry-level accounting job online. Is not required to get a job in accounting but it is suggested. Depending on where you are and what school you attended, some states may require additional coursework beyond your bachelor's degree to be considered for a career as an accountant. Related: How To Find Entry Level Work from Home Jobs – No Experience Required! They have nearly 200 different accounting jobs currently available. Upwork will break down an estimate of how many hours will be needed for each job and the compensation you will receive for each accounting task. Once you get going with Upwork you will be able to set your own hourly wage. When people browse for accountants they will see how many jobs you completed, how much you’ve made, the hours you’ve worked, and how many of your jobs have resulted in a great experience for clients. Guru is another way to connect with employers who need accounting related work done. You would join the three million freelancers worldwide who use Guru as a place to grow a business. You can set your account to be paid by each big milestone completed during each job, hourly, or by task completed. Jobs are constantly posted on Upwork so be sure to keep an eye out for new opportunities. You can use PeoplePerHour if you are searching for an entry level accounting job and others. The UK based company lets you browse the jobs by whichever category you would like and send a proposal. You can sometimes see a very detailed description of what is needed. You can also see what kind of questions other freelancers have had about the job and who was interested enough to send a proposal about the opportunity. With Freelancer, you can bid on different accounting jobs potential employers post about. This website also lets you see how many people have bid on the job and how many the company will pay for the work to be done. The thing that makes Freelancer stand out is they post how many days are left until the decision will be made. That way you know about how long you will be waiting to possibly hear back about the job. If you need somewhere to look for accounting job options in your area Nexxt can be the perfect place to go. You can find a background of the job and what they are all about. Be sure to do your own research as well. You will see a breakdown of the salary and what kind of skills are needed for the job. Once you are ready for a job outside of just entry level you can also use Nexxt to search for senior and better-paying opportunities as well. Flexjobs is a paid job search that you can use to find entry level all the way to executive jobs in a variety of fields. As an accountant, you can find both part-time and full-time work. Flexjobs also has freelancer options to choose from as well. When you sign up you can personalize your job search to whatever your situation may be. There are about 10 different options to choose from and you can choose what type of jobs you will be shown. If you want to visit one of the most respected job search websites out there than Indeed would be the place to go. Many companies use Indeed as the primary way to promote job openings. If you don’t want to miss any opportunities in your area make sure that Indeed is a site that you visit as much as possible. Most jobs will have the salary you will be making each year and different reviews people have had with the company. You can even upload your resume on the website so you can have easy access to slightly edit it if you feel you need to for a specific accounting job. You can also use Indeed to track the status with each application you turn in and when you applied. If you are interviewing for a position you can update that on the website or if you’re hired you can also change the status to that. If you are wondering what you should be making Indeed also lets you look up the salary average for job titles. Accountants have a few different options to choose from when looking for entry-level jobs. This is also a flexible job that you can do in the office or from home. Experience isn't always necessary, but it can certainly help. the downside of upwork is that you have to compete with people overseas who bid jobs for $3.50/hr. That’s tough to compete with in regard to setting your own rate at anything remotely close to a livable amount.